Halloween starts early this weekend at Third Place Commons with the first of three fun, family-friendly events, our 6th annual Halloween Hafla Belly Dance Event. Head to the Commons stage this Saturday, October 29th at 2 PM to enjoy a performance for the whole family from Silk Rain, A Dance Company. Then, don’t go far because at 6 PM the Commons will offer up another free community dance lesson for folks of all ages. Celia Boarman will teach the basics of East Coast Swing to one and all in an easy, one-hour lesson to get you ready for a night of dance ahead. No partner is required, so come join in the fun! Of course, the dance lesson is just the warm-up for the main event, Saturday night’s Halloween Dance Party with the 85th Street Big Band. This newly-minted annual tradition started last year and was a big hit with the band offering up costumes and lots of fun surprises. The band is promising plenty more zany, Halloween treats this year as well, so you won’t want to miss the fun. Come in costume or come as you are. The show starts at 7:30 and all are welcome! Finally, the Halloween festivities end in a grand finale on Monday, October 31st – Halloween night. Highlights include trick-or-treating for kids across Lake Forest Park Town Center from 4:00 to 6:00 PM, followed by the Zero and Somebuddy Happy Halloween Clown Show at 6:00 PM. 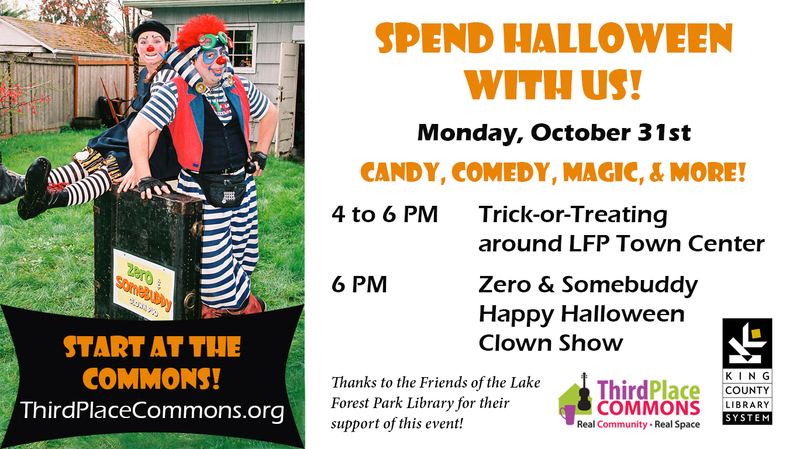 Zero and Somebuddy will bring family-friendly comedy, magic, and plenty of fun surprises to the Commons on Monday evening, and after the show, they’ll stick around to create balloon animals for the kiddos in the audience. The Zero and Somebuddy show is sponsored in part by the good folks at the Friends of the Lake Forest Park Library, so thanks to them for making this fun, family event possible! Start at the Commons between 4 and 6 to pick up your first candy treats and get the scoop on everything that’s happening. The come back to the Commons with your goody bags full by 6 to see the show. Costumes encouraged! Third Place Commons is a community-supported nonprofit organization dedicated to fostering real community in real space. Events at the Commons are always free and open to everyone, so join in the fun!